Maybe September debuted in The Oscar, a 1966 American drama film written by Harlan Ellison, Clarence Greene, Russell Rouse and Richard Sale, directed by Rouse and starring Stephen Boyd, singer Tony Bennett (in his film debut), comedian Milton Berle (in a dramatic role), Elke Sommer, Ernest Borgnine, Jill St. John, Eleanor Parker, Joseph Cotten, Edie Adams, Peter Lawford, Broderick Crawford, Ed Begley, Walter Brennan and Jack Soo. Also appearing are Bob Hope, Hedda Hopper, Merle Oberon, Frank Sinatra and Nancy Sinatra as themselves. 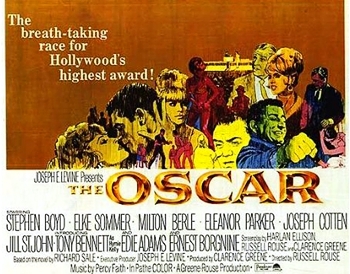 The film features an impressive cast and crew, including several real Academy Award winners: eight-time costume design winner Edith Head (who would also be nominated, but not win, for The Oscar); Best Actor winners Borgnine and Crawford; Best Supporting Actor winners Begley, Brennan (three wins), Sinatra and James Dunn, and cinematographer Joseph Ruttenberg. Also in the cast were Oberon and Parker, who had been nominated for Oscars but did not win. Tony Bennett, The Great American Composers, Jay Livingston & Ray Evans, Columbia House 2C2 8651 / C21 8651.